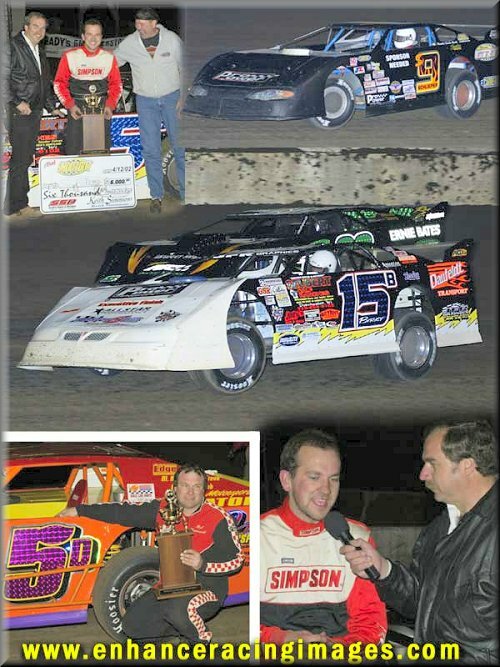 The first of 12 Budweiser Open Late Model Shootouts was held on Friday, April 12th at the Davenport Speedway � mile dirt track. The event hosted a stellar field of 68 open Late Model drivers much to the delight of the fans and the officials of Simmons Promotions. When the checkered flag flew on the Iowa Illinois Taylor Insulation 50 lap feature Brian Birkhofer had garnered the $6,000 pay day. Birkhofer was the first to admit sometimes it is very good to be lucky, but you must be in the position to take advantage of good racing luck when it comes your way. Dan Schlieper was the man to beat all night, Schlieper had qualified for the pole position by virtue of winning the Hollywood Graphics fast dash. The top six in finishing position and passing points ran the dash to qualify for the first three rows alignment. Schlieper out ran young Brian Harris to earn the pole position. Schlieper built a commanding lead in the early going of the 50 lap main, but his lead was erased due to a lap 23 caution . On the restart Brian Birkhofer passed Brian Harris to take second and began to set his sights on Schlieper. Birkhofer was not able to catch the strong running Schlieper. On lap 42 misfortune struck Schlieper, his left rear tire went down forcing him to the infield and to restart at the rear. Birkhofer held the lead the final 8 circuits to score the win. Denny Eckrich shot by Brian Harris on the final restart to secure second, Harris took the checkers in third ahead of Darren Miller and Chris Spieker. 6 heat races, 2 consolations and the Auto Acres non qualifiers race were all run prior to the 50 lap main event taking to the track. Skip Frey used the bottom side of the track to shoot to the front and out race Kevin Weaver to win the 10 lap non-qualifiers race. The Modifieds were also on the card on Friday night, Bob Dominacki delighted his hometown fans by winning the JR Motorsports feature event. Dominacki found the top side of the smooth track to his liking in scoring a hard fought win over Ron Barker. Barker was able to close on Dominacki but was unable to get by, and settled for second ahead of Scott Nesteby, Jim Sandusky and Bruce Hanford. The Simmons Promotions team will return to the Davenport Speedway for another exciting Budweiser Open Late Model Shootout on Memorial Day, Monday, May 27th . 2. 28E Dennis Erb-Carpentersville, IL. 3. 26B Wayne Brau-Anawan, IL.